Tattoo Artist, a Norman Rockwell painting, appeared on the cover of The Saturday Evening Post published March 4, 1944. This is yet another timeless favorite of Rockwell collectors, a classic for all the ages. Alternate titles for this painting are Only Skin Deep and The Tattoist. This painting was Rockwell's second cover for The Post in 1944. In 1944, there were nine Norman Rockwell Saturday Evening Post covers published. This painting was also Rockwell's 219th overall of 322 total pictures featured on the cover of The Post. Rockwell's career with the Post spanned 47 years, from his first cover illustration, Boy With Baby Carriage in 1916 to his last, Portrait of John F. Kennedy, in 1963. The original oil on canvas painting, 43 x 33 inches or 109 x 84 cm, is currently part of the collection of the Brooklyn Museum. on page 155 of Norman Rockwell, A Definitive Catalogue by Laurie Norton Moffatt. Two of the photographs that were taken during the production of this painting, as well as the painting itself, are reproduced in Norman Rockwell: Behind the Camera by Ron Schick on page 73. This classic Norman Rockwell painting shows a tattoo artist plying his trade and practicing his art. Tattoos are all the rage now. Everyone, from sports figures to chefs on TV, seems to be covered with them nowadays. I even have one, tasteful and well hidden, of course. Interest in tattooing seems to be cyclical, like most other social phenomena. Servicemen, like the fellow in the painting, have long been fond of tattoos. I remember my uncles all had one or two. Tattoos are a permanent reminder of our feelings at the time of our adornment. Those feelings may change, but the tattoo is timeless. Rockwell is commenting on that perceived permanence and timelessness with this painting. This sailor has apparently been in love several times during his tour of duty. Betty is the latest object of his affections. Before Betty, there was Sing Le, Olga, Mimi, Ming Fu, Rosietta and Sadie. The handwriting for all the names looks the same. So this same tattoo artist has dutifully crossed out the previous woman's name and etched the new love's name six times so far. What will our sailor do if or when he runs out of room on his bicep? We can observe his elbow and the back of his hand. Those parts are tattooed and presumably his entire forearm is decorated as well. His bicep appears to have a little more blank space for perhaps one more name if necessary. That begs a question, though. How did he come to leave such a large area untattooed that it would accomadate so many names of so many former love interests? One has to wonder if his right bicep is already completely covered! This painting was painted while Rockwell still lived in Arlington, Vermont. His good friend and fellow artist/illustrator Mead Schaeffer posed as the tattoo artist. We can only see his back. He apparently handled the stylus like a professional since that is how Rockwell would have posed him. Clarence Decker, a neighbor of Rockwell's, posed as the sailor. Decker was the Master of the Grange in Arlington and posed in quite a few Rockwell illustrations. Rockwell also continues the theme of the painting into its background. Tattoo Artist was only one of 322 Norman Rockwell Saturday Evening Post covers; Here is the list of Norman Rockwell Saturday Evening Post cover illustrations. He uses the background to show us some of the more popular tattoo designs of the day. The most prominent is the perenially popular dragon tattoo design. We also can see tributes to mother, shipmates, love, good luck, faith, US Navy, friendship, old pals and roses and other flowers. To add authenticity, a Rockwell trademark, Rockwell actually borrowed a tattoo machine from the Bowery tattooist Al Neville. 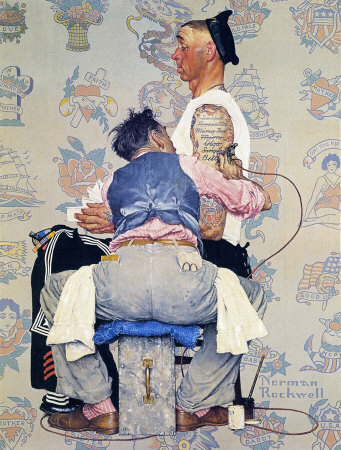 No doubt, Rockwell consulted with Neville and former sailors in his quest for accuracy in his painting of The Tattoo Artist.